Pat Mahaney, 45, was treated for internal wounds at a local hospital for four days before his release Tuesday. Police said doctors had to insert a tube down his throat to remove all of the blood from his stomach. A man in Ohio was severely beaten by six teenage boys who said they did so because they were bored, police allege. 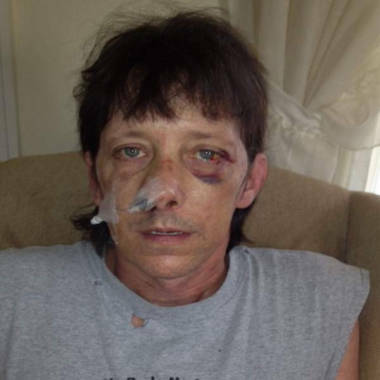 Pat Mahaney was walking home from the store in North College, Ohio, Saturday with a six-pack of beer, looking forward to a quiet evening watching sports, when something hit him in the back of the head. Police said the six boys, ages 13 and 14, “were just bored and looking for something to do” when they ambushed Mahaney from behind. He was immediately knocked unconscious. During the attack, one of the boys hurled a beer can at Mahaney’s head, police said. “The next thing I knew I woke up on my neighbor’s front step and the life squad was there,” Mahaney, 45, said. An officer responding to another call spotted a crowd of people gathered near Mahaney’s home. Several witnesses told the officer Mahaney was covered in blood after being “jumped by six children,” the police report said. The boys were arrested and taken to Hamilton County’s juvenile detention center, where they were released a short time later. They face felony charges of aggravated riot and felonious assault and are on house arrest at their parents’ houses, court officials said. Mahaney said he has no health insurance and has been unemployed for years. He said he has been looking for factory work. The boys are scheduled to appear in court Aug. 24.